Since starting this blog about a year and a half ago, I have a whole laundry list of topics that I’ve been meaning to write about – one of them is about publishing a book for sale online and another is a series of interviews with fellow photographer friends – both amateur and professional and anywhere in between. With this post I get to touch upon both topics. A few months back, a friend of my husband’s contacted me about what photo book companies I would recommend to publish a book online. Although I hadn’t personally created a book for sale, I pointed him to my Photo Book Software Wizard which allows you to narrow down companies that offer certain features such as the option to “sell online”. I also specifically mentioned to him Lulu and Blurb as two of the better known companies that feature the ability to sell your creations online. Many of us who have created a one-off book of photos understand the value of being able to print a single book. 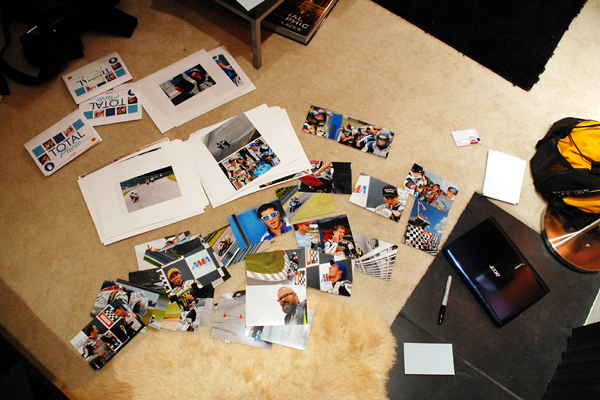 Most individuals making photo books for their own enjoyment don’t need 100 copies (unless you have a huge family!) Similarly for aspiring authors and photographers, the benefit of digital printing is eliminating the need to spend significant sums printing large runs of books with the traditional offset printer. You may or may not be able to sell a large inventory of books. With sites such as Lulu, Blurb, Viovio, Bookemon etc. offering a way to sell your books (without printing a single copy), digital printing has opened up so much opportunity to test the waters at basically no risk at all. So, Dan and I exchanged a few emails and Dan told me he ended up choosing Blurb. I asked if I could interview him for my blog about his photography, as well as his experience creating and selling his book online with Blurb. Luckily for us he agreed. 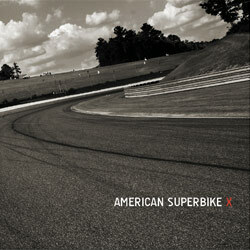 The topic of his photography and book is motorcycle road racing (which I mistakenly called motocross initially – oops!) In short, motocross races run on non-tarmac courses made of dirt, sand, mud etc. and generally involves changes in elevations, while road racing takes place on tarmac. (Did I get that right Dan?) 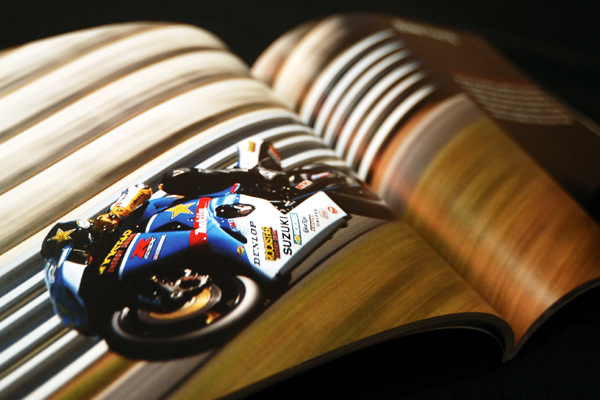 See for yourself – check out Dan’s book of dynamic road racing photos at the Blurb Bookstore or on his website. PBG: Dan, how did you get started in photography? DL: Heh, it’s kind of a two-part answer for me. I bought my first camera about 9 years ago, shortly before going to China for the first time and figured I might as well take some pictures since I probably won’t get to go there often. It took a short while after the trip for the interest to really set in and I ended up abandoning the hobby just a couple years later. 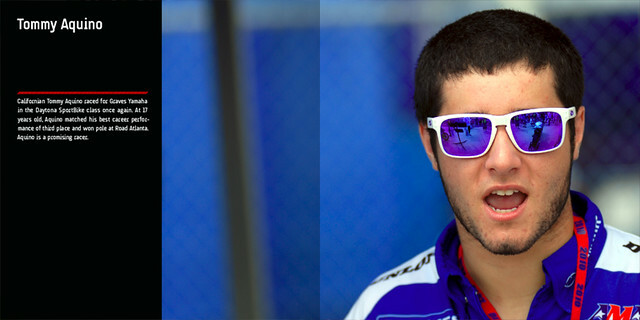 After a 3-year hiatus I took up photographing professional motorcycle races. PBG: Do you have any recommendations for new photographers? DL: Go out and shoot, there’s no better way to learn. A good exercise is to pick a subject (it can be something mundane like a fire hydrant, for example) and force yourself to shoot it in 50 different ways. Try shooting it up close, from far away, with a wide lens, horizontally, vertically, with your camera tilted, etc. Don’t worry too much about how it will look, just keep shooting. Afterwards you can take your time looking through them and see which shots worked and which ones didn’t and go on from there. PBG: What recommendations do you have for new photographers for buying their first DSLR? DL: These days, even “entry level” cameras are more than capable of meeting most photographers’ needs so don’t hesitate to take them into consideration. Higher end models will offer improvements in speed and operational efficiency but beyond that will not help you take better pictures. A better camera simply makes the job easier. As for lenses, figure out what you want to shoot before buying them. It’s all too easy to get sucked into buying a bunch of lenses thinking that you “need” them and they just end up becoming high quality paper weights. Also, despite camera companies pushing long zoom as a favorable feature it actually isn’t that useful in everyday situations. If you do decide you need shop for a lens, don’t get too caught up with staring at focus charts, color comparisons, etc. At the end of the day, all modern optics are more than adequate for general use. PBG: What kind of gear do you use? DL: I have two Nikon D200 bodies, a D80 kit lens (18-135mm), and a Sigma 120-300mm. I also have an old Nikon 50mm but unfortunately it doesn’t get nearly as much use as it deserves. When I remember to pack it, I’ll use an SB600 speedlight for occasional fill-flashing purposes. PBG: Tell me about your book – the topic – how did you get started photographing in that area? DL: My book is called ‘American Superbike X‘ and it’s an overview of the 2010 season of AMA Superbike, the highest level of motorcycle road racing in the U.S. I’ve been a fan of motorcycle racing for many years and after I lost my job in 2008 I decided on a whim to try shooting races. Needless to say, I’ve been kinda hooked ever since. PBG: Have you made photo books before? DL: No, this was my first time. PBG: What made you choose Blurb? DL: I’m pretty lazy when it comes to research so I can’t say I looked around too much except for contacting you but I’ve heard a lot of good things about Blurb anyway. My brother Ivan Lo is a professional humanitarian photographer and he has made a book through Blurb a few years back and it turned out pretty nicely. PBG: Did you use the company’s software to make the book? Or did you decide to use your own program? If so, what program and why? DL: I used Adobe InDesign. Even though I never had any complex layouts in mind, I’m not a big fan of working with pre-existing templates in general and InDesign came highly recommended. It was also my first time working with the software so I probably made the overall process a bit more difficult for myself! PBG: How did you find your experience with Blurb’s PDF upload? Can you describe some of the procedures for doing the upload? DL: It’s pretty easy and straightforward. There are just two files involved in Blurb’s book-printing process: one for the cover, the other for the pages. Once you have them done, it’s just a matter of uploading the two files and filling in the book’s title, description, price, etc. Blurb will then run your files through their “preflight check” which basically just makes sure your files are of the proper dimensions. Once that is done you are ready to order. PBG: What do you think of Blurb’s print quality? I’m pretty happy with it. For my first test copy I purposely refrained from any paper upgrades just to see how it would look and I was pleasantly surprised by the results. I ended up keeping it as is. A photo of Dan's photo book printed with Blurb. PBG: Are you selling your book with Blurb? Yes and no. I’m mainly selling it on a website I made specifically for the book but it is also searchable through Blurb’s online bookstore. Selling it through Blurb is nice because you can pretty much kick back and let them handle the entire payment and shipping process and you never need to carry any inventory, but the downside is you can’t tell who placed the orders. It may not be a big deal for everyone but for the sake of my business it’s nice to know who my customers are. PBG: How did you figure on the selling price for your book? DL: I just looked around at some comparable photo books outside of Blurb and made sure I didn’t wander too far from the average price range. Wish I had a better answer for that one but it’s what I did. PBG: What advice would you have for others (pros/cons) – tips you found out? DL: This is more related to Adobe InDesign but if you go that route, make sure you are familiar with the software otherwise it could potentially produce some unexpected results in print. Yes, I learned this one the hard way! Also if you do decide to carry inventory, it may be handy to know that the total shipping costs between one and ten books is almost the same. PBG: Would you recommend Blurb to others? DL: For sure. They make book-printing a relatively easy and painless process even for first-timers and definitely no complaints about the print quality. PBG: If money were no object, what piece of photo equipment would you buy and why? DL: I try not to get too hung up on equipment so I’m pretty happy with what I have at the moment. I would probably pick up some sort of ultrawide lens (maybe a 10-20mm, for example) just to be able to shoot wider stuff, that’s probably about it. Maybe upgrade the camera bodies to something newer? Sorry for the boring answer! 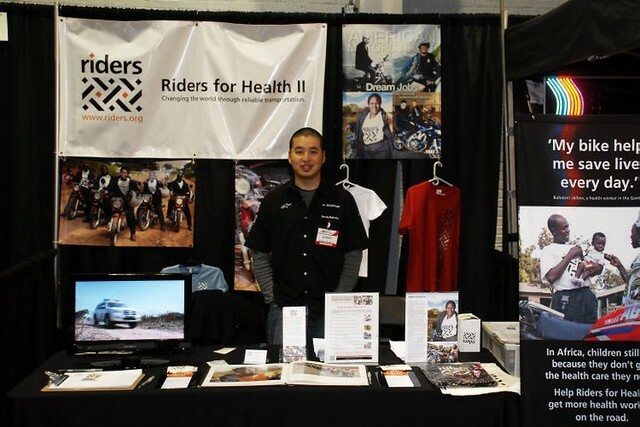 The photographer himself at a local road racing show. Thanks to Dan for sharing his tips and experience. Have any of you created a book for sale before and have any tips to share? Please feel free to comment below! I just wanted to add a caution about the Blurb PDF to book option. When I made my book in Dec 2010, it only took InDesign PDFs. I had done all my work thinking a PDF was a PDF, not true. I had to save each page as a jpeg and upload them one by one. Hi. Just found this blog which I thought was quite opportune as only two days ago I decided to make a photobook of the wildlife that visits our home daily and yesterday found BLURB after a bit of hunting around. Didn’t know anything about the Adobe InDesign or other software options and have used the BLURB software to create a 50 page photobook – well finished uploading the pics I want to use this morning. My biggest issue was deciding on what photos to use as I have hundreds taken over the past 3-4 years, many of which are on my Facebook page. One of the reasons I decided to go with BLURB is because I can create a PDF file of the photobook (hoping I can use this promote the book) and also an ebook version for IPad. The big plus of course is that BLURB can handle the reselling of the photobook with me doing the promotion and providing a link to BLURB for a buyer to make a purchase. All in all, the experience so far has been pretty painless and hoping to finalise everything and have it up on the “internet bookshelf” within the next day or so. Following my post yesterday I can now advise I have just published/ordered my first photo book and am a bit excited – for a 60 year old with a heart condition I need to be careful. Also bought a PDF version which I will use to help promote the book. Here is the link to the book and it would be great to hear what people have to say and suggest re: promoting this book. Cheers. I took a peek at your book – looks great! Good luck with your project!